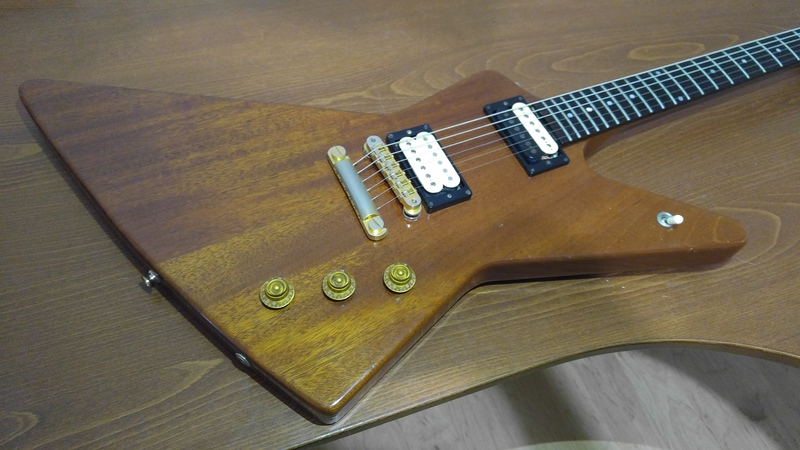 Gibson Explorer copy or ??? Got this guitar a few weeks ago. 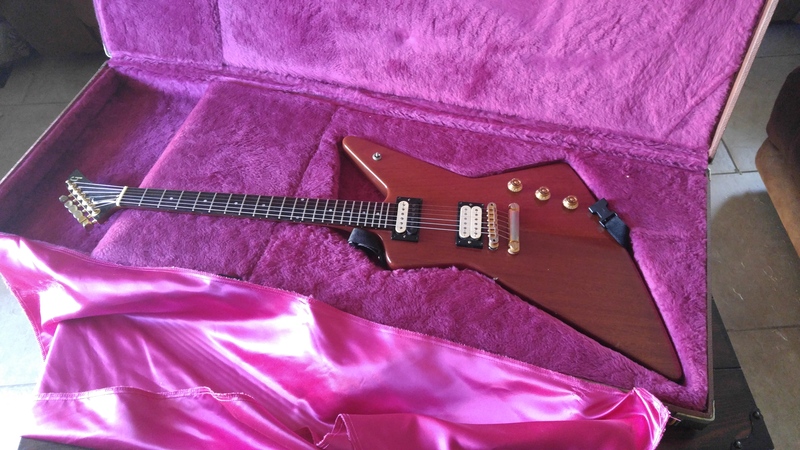 It came in an original Gibson USA explorer case. 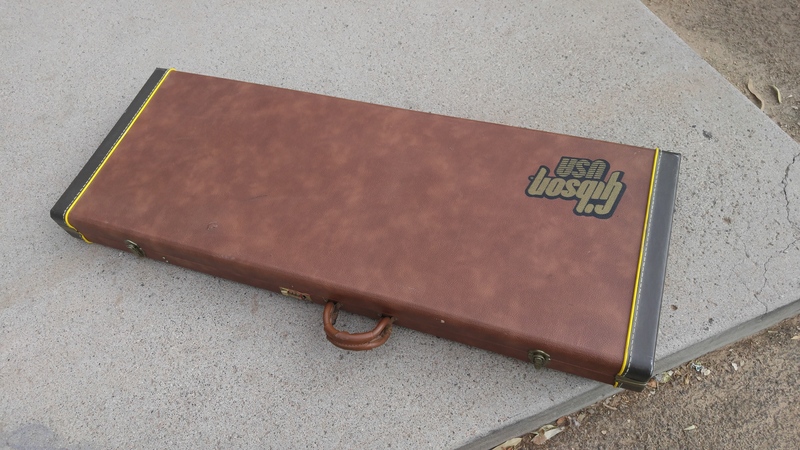 The guitar and case appear to be possibly 20 to 30 years old. 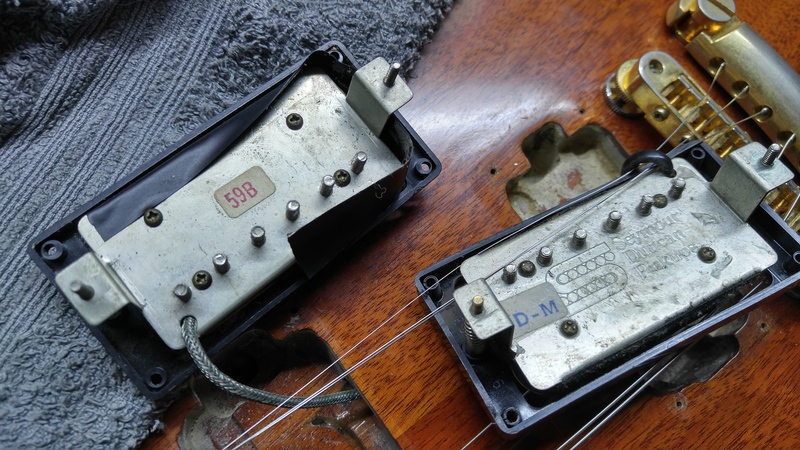 - Seymour Duncan pickups, possibly from the 80's? See pics. 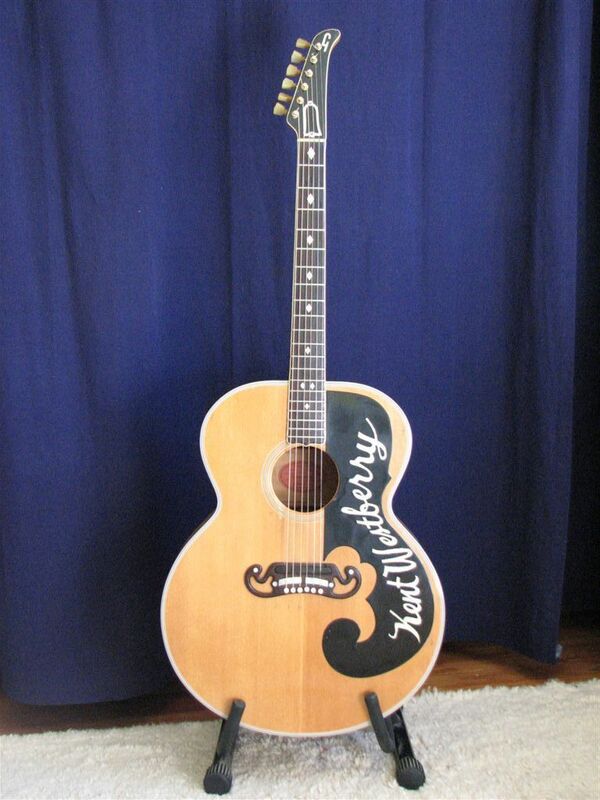 The only markings on the guitar is the Gibson-styled "G" on the headstock. It plays well and the pickups sound pretty good to my ears. Stays in tune. Looks great, lot of little playing marks, dings, a chip or two. 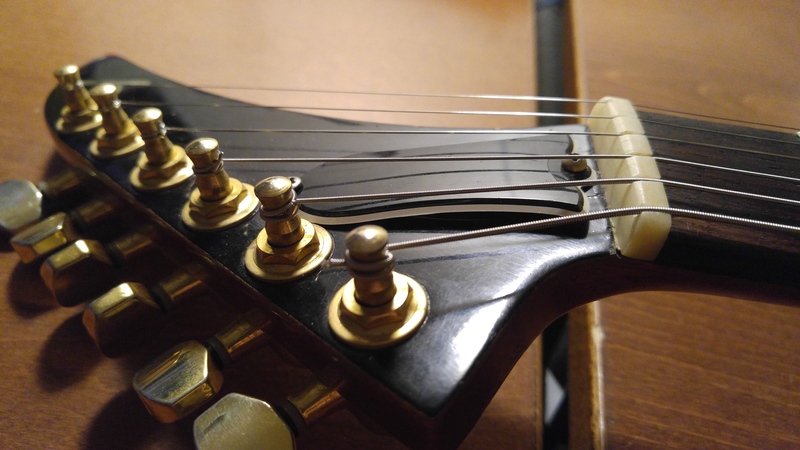 One issue though, the truss rod cover does not lay flat and flush to the headstock because the end of the truss rod sticks up a bit. 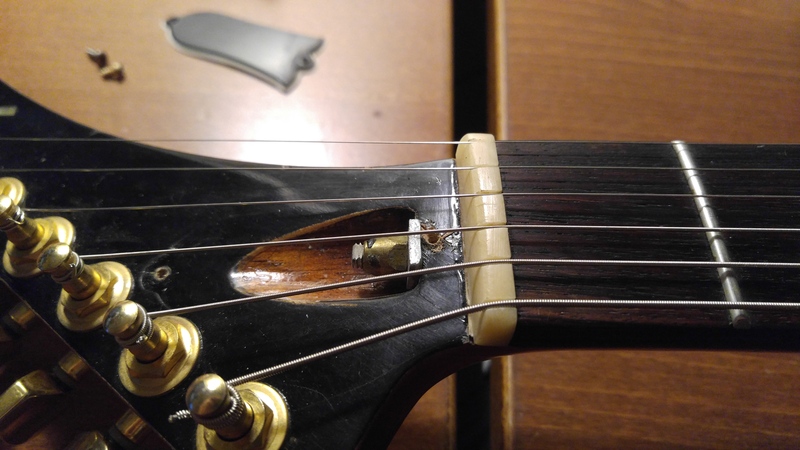 So the truss rod cover is curved. See pics. 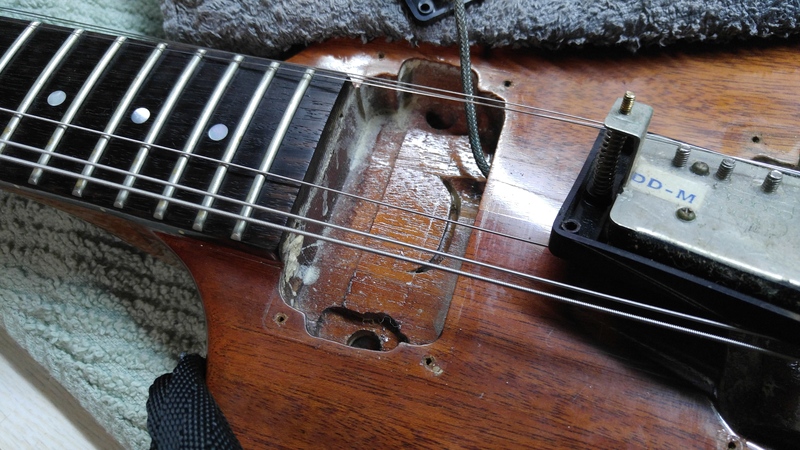 Chances are that this is a pretty well made copy that some luthier did back in the day. But, if you have any other info to offer or ideas or questions, please feel free to post. I don't know who made it but it looks nice, I like it. I'm practically 100% sure it's not a Gibson, but it looks very nice and well made! Mayyyyyybe it's a John Bolin made for Billy Gibbons... ? Its a copy of the first prototype Explorer. And Billy Gibbons does have one. I seen them way back in the day. here is something that I found on another forum. Different headstock. "From what I've read the single "G" logo was used on some of the early models as Gibson wasn't sure about using their standard logo on these guitars. I think there is at least one real Flying Vee that has the same thing. As for the prototypes, those are Futuras, I'm assuming the Explorers with the split headstocks represent the redesign of the Futura, in essence, the Explorer prototype(s)." You might want to get ahold of Gibson. I see that are already in the Gibson forum. I wouldn't call that fake, until I had confirmed it. Looks very much like Gibson work. As a side note... the 2017 Explorer I just traded, had a similar issue with the TRC not laying flat. As noted, for many reasons, definitely not a Gibson but a good copy. nitrodave08 - I sent them an email but have yet to hear back. They either laughed the email into the trash bin, or, they forwarded it to and are waiting to hear back from Billy Gibbons??? No, it doesn't. And it isn't. 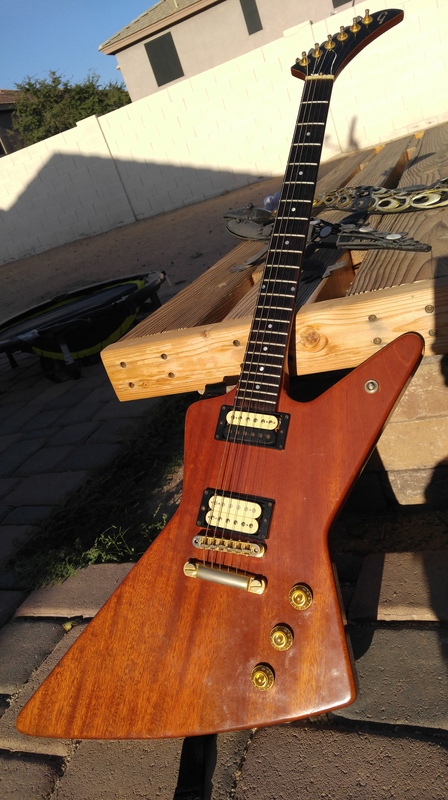 I wouldn't call it "fake", but a copy, because its clearly not a Gibson. 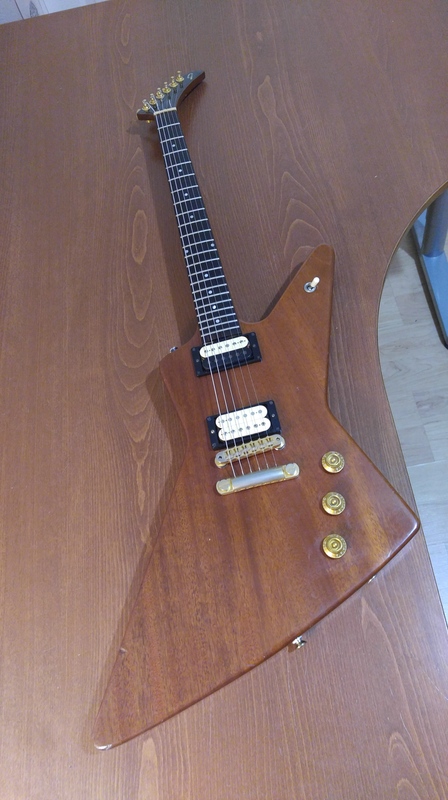 If someone were to present it to me as a real Gibson, then I would call it fake...but its so far off it would be a horrible fake. Very well could be a fantastic guitar, aside from that back-and-forth radius issue and pencil thin nut width. And no, I'm not going to argue with you about it. 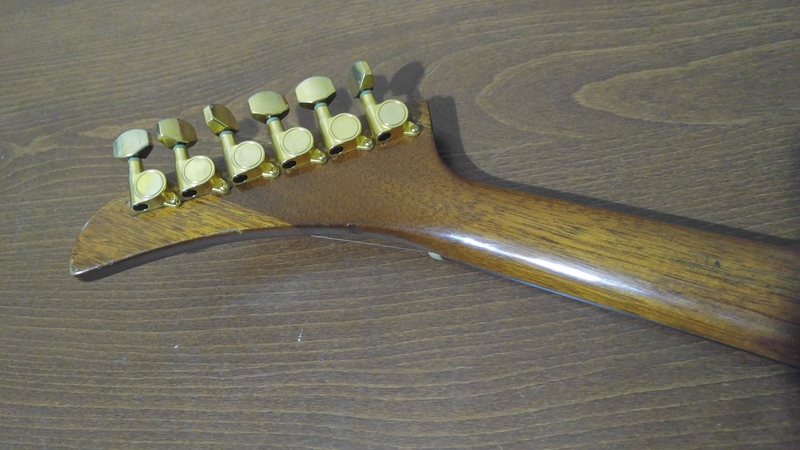 P. S. Why don't you check out the nut width on the Angus Young Thunderstruck. Yeah, I don't think it is a real or prototype Gibson. 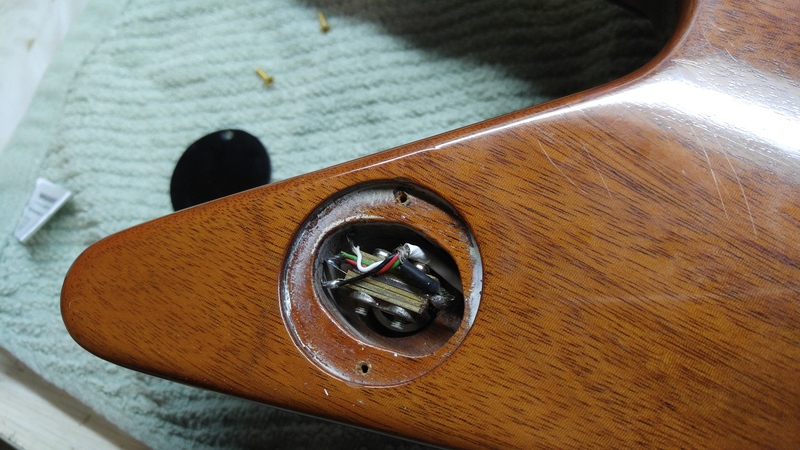 But regarding the radius; I've heard of compound radius necks, but I thought they would begin with one radius then taper to the other radius at the other end of the fretboard. Either this flatter, then rounder, then flatter radius was a mistake, or I wonder if it was intentional. I'll have to play it some more to see if there seems to be any benefit. 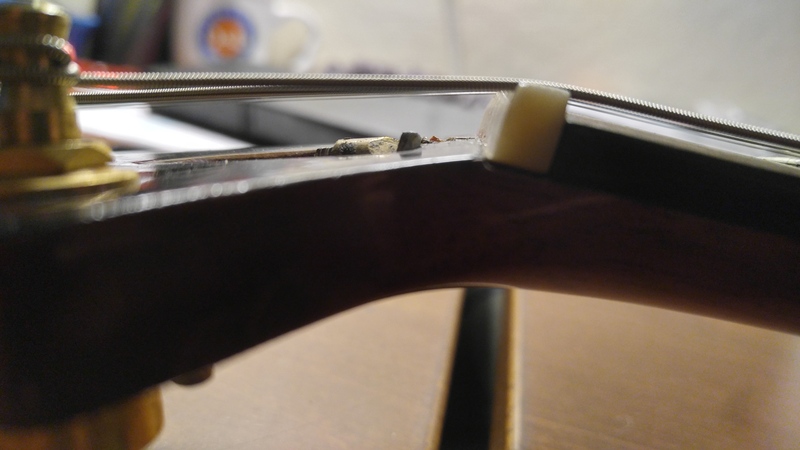 I should probably measure again, and maybe look at the fretboard a little closer to see if maybe it is in fact some warping near the middle of the fretboard. 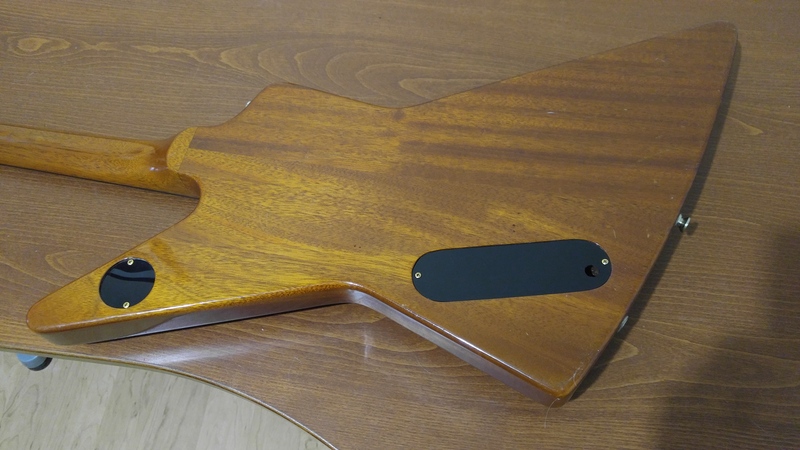 Another thing to look at are the control cavity and 3-way toggle switch routes on the back. They look to be done by hand. The control cavity route is mostly straight along its length, with the ends not exactly round. 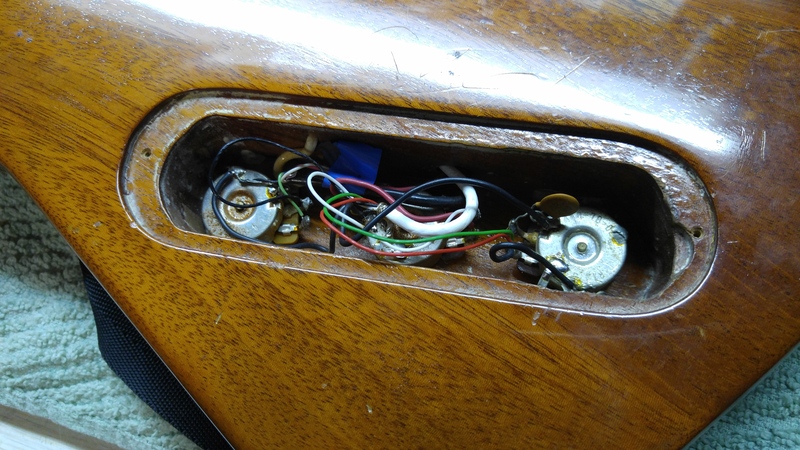 And I've never seen a 3-way toggle switch routed oval like that, and not symmetrical either. Even the pickup routes look hand done if you look at them closely. Yeah I've never seen anyone purposely compound radius a neck in the middle like that. 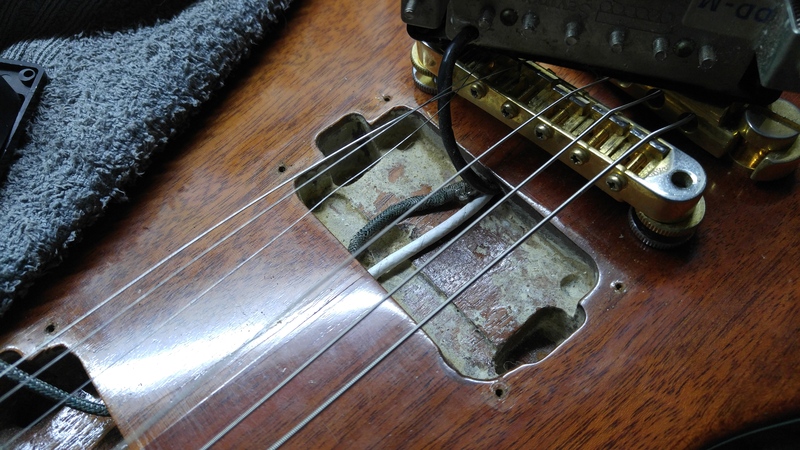 Unless it was a bad refret job where someone sanded the fretboard by hand - if its as old of a guitar as it looks that is always possible. 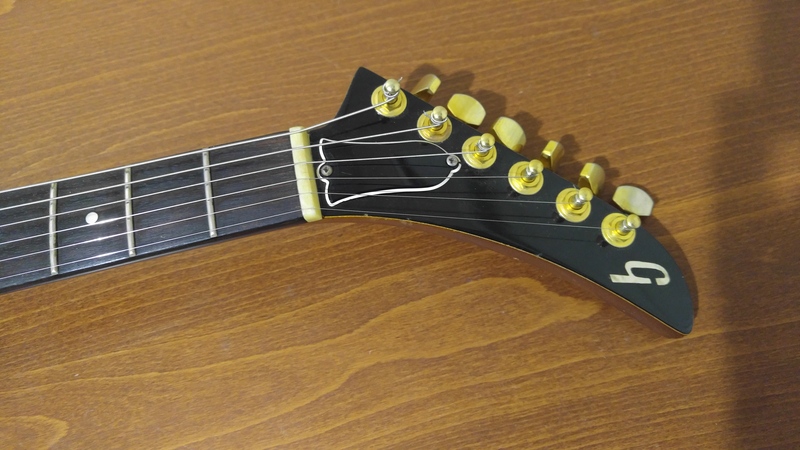 That headstock could be shaped to look more Gibson-accurate, but I think that part is cool as is. That with the nicely grained Khaya kind of reminds me of the ESP explorers and Metallica, more than a gibson. The 9.5 radius portion of the fretboard sounds pretty interesting, I love that on my PRS, but wonder if I would be weirded out not feeling a 12" on an Explorer. I would totally rock that guitar. Nhtom even gave you the model.